2 Good Claymates: To Glaze or Not to Glaze - That is the Question! How We Do It . . . Tips & Tutorials in a Snap! To Glaze or Not to Glaze - That is the Question! 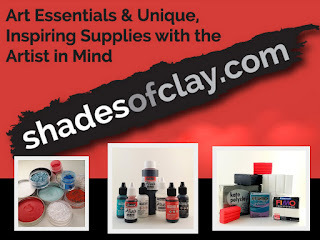 On several polymer clay guild forums there has been much discussion lately on glazes -- what type to use, what works best, what technique works best. Since I include finishing techniques in my last three tutorials (Double-sided Textured Beads, Textured Tubes & More, Making Beautiful Buttons), it got me thinking about sharing more in depth on this topic what we use for finishing our pieces and why. The first question is to glaze or not to glaze? This all depends on the type of finish you want. 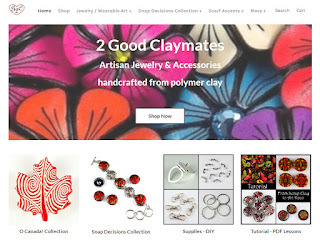 A lot of polymer artists prefer their pieces to be natural and unglazed. We prefer that at times ourselves -- it all depends on the individual piece and the finished look we are aiming for. You can get a nice sheen by buffing with a soft cloth or towel and you can also get a high shine if you buff with some sort of buffing wheel. If you are aiming for this... your piece needs to have a very smooth finish. This involves sanding your work with different grits of wet/dry sandpaper. I have also found that the smoother your clay is before baking, the less sanding you will have to do afterwards. Some people finish with 1000 grit sandpaper, others go up to 1500 or 2000. I have found that there isn't too much difference in smoothness or shine above 800 grit so it is all a matter of what clay you are working with and your own preference. Then there is the type of buffing wheels to use. Dave and I were on a hunt some time ago looking for just the right buffing tool that wouldn't break the bank. Some of our clay colleagues had fabulous buffing machines that were to drool over but we decided to go simply and make more use of the tools like our dremel, we already had. I read up on Desiree McCrory's site about her new buffing pad and so we went on a hunt to find the right fabric to make our own. It is a simple concept but does a beautiful job and leaves a really high sheen! We use a drill press stand so it frees both hands to buff making it easier and safer to use. If you are interested in buffing pads already made, I have them available for sale here. So if you prefer to glaze your pieces, many have asked which one do you use and what works best. This is something that is a little different for everyone but I will share with you what we have learned from our past experiences. Some polymer clay techniques using inks, mica powders or chalks, require some sort of glaze finish in order to protect them from wearing off. One of the newest type of glazes that polymer clay artists have discovered is the PYM11 (Preserve Your Memories 11). This is amazing stuff and works well as a sealing agent, especially if you are using inks or mica powders. It leaves a soft matte finish so if you prefer your piece to be glossy, you can use PYM11 as a sealer and then coat with Future acrylic afterwards. PYM11 is only available as an aerosol spray so is a more difficult to use on smaller type beads. It also has a very strong odor so you will want to use this outdoors in the fresh air so you do not breathe in the fumes. How to Use: Lay your pieces out onto a paper lined tray. Spray your pieces very lightly. Allow to dry (a few minutes) and then turn your tray around so you are spraying from the opposite direction and give a light spray again. Turn your pieces over and repeat for the other side. Con: Only available in an aerosol spray so is a little more difficult to use on smaller type beads. Diamond Wood Finish by Flecto is the only type of varathane we consider safe to use with your polymer clay. We have tried various other brands (such as Minwax acrylic) and discovered they are not all the same. They would peel and wear off and I'm glad we only experimented with them in a small way first. The Diamond by Flecto is available in glossy, semi-gloss and satin finishes. It is also available in an aerosol spray which is great for larger type surfaces. In many of our pieces like our animal prints, we prefer to use semi-gloss as it actually gives more of a soft satin gloss look and isn't overly shiny. I fill a small jar to use from instead of using it straight from the can. If it gets a little too thick, you can add a little water to thin it out and it will apply much easier. How to use: A good quality clean soft paintbrush is the key. If you do not use a good brush or have too much varathane on your brush, it will cause streaks. Apply several very thin coats, allowing to dry thoroughly in between. You might still notice a bit of streaking after the first coat but that will eventually lesson after each application. After your pieces are dry, you can harden your finish a little more by baking your pieces at 200 F for 12-15 minutes. This also helps get rid of any small streaks that might still be showing. Pro: Dries very quickly between coats and leaves a nice finish. Con: Not so good on items with a lot of mica powder, chalks or inks as a sealer. The other type of glaze we use is Future -- which is now called Pledge with Future. You can see by the photo that I still have the old style bottle and how little we've used over the past 5 years or so! A little of this goes a long ways and one bottle will seem to last forever! This is our preference when we want our pieces to have a permanent high shine. We especially prefer to use it on pieces that require more wear and tear like pens or mirror compacts. If our pieces have mica powders, inks or chalks applied, we generally spray them first with the PYM11 and then coat with Future to add the shine and add a little more protection. How to use: You can use a clean soft dry paintbrush or some people like to use q-tips. Both work good but I prefer a brush. Apply several thin coats, allowing to dry thoroughly in between. Future takes a little longer to dry so takes a little more patience. I found that if you apply the next coat too soon, it leaves a lot of streaks so I have to wash it off or sand it and start all over so is best to allow to dry completely between coats. You can also harden your finish more by baking again afterwards at 200 F for 12-15 minutes. This also helps to bring out a little more shine. Pro: Makes a good hard finish and works well for sealing pieces when using mica powders, chalks, etc. as well as long wearing items such as pens (see note below). Should also mention that it has a very nice and pleasant smell. Con: Very time consuming as several coats need to be applied with lots of drying time between coats. If you are using mica powders to your piece, they must be applied on raw clay before baking or they will not stick. Rub the powders into the clay with your finger rather than just "dusting" them on with a brush to make them "stick". After baking, wipe off any excess powders with a soft dry cloth. If there are any loose mica powders on the piece they can prevent it from being sealed. You can then continue with applying your favorite sealant. If you want it to be more durable, spray with PYM11 first, allow to dry and then apply several coats of Future Acrylic or Varathane. If you are using the brand "Pearlex", you do not have to seal as they contain a resin, however, if you apply future acrylic or varathane afterwards, the colors will "pop" more. I hope this helps answer some questions you might have regarding finishing your pieces. Feel free to ask any questions or leave other tips and tricks in the comments here. Carolyn, I use the Future on my items too. Out of all I've tried I like it the best and the smell isn't bad. You may not agree with what I do but if I want a high shine I don't apply with a brush. I take and dip the piece into the Future and put aside and let dry. Usually one dip gives me the shine that I want. Thanks for your comments Dana -- I forgot to mention that I like the smell of future too! I should add that to the Pro comment. I have been finding out from others how they dip their pieces in the future -- I read somewhere not to but now rethinking again. I will experiment a little with this and see. Thanks for all the great information around glazes Carolyn! Love your buttons... they are gorgeous. Thanks for this Carolyn. Very much appreciated. I am fairly new to the PC world and am making puffy heart pendants that I'd like to make into necklaces. Up to now I have just buffed them with a peice of denim to get a nice finished sheen. I'd like to get a more glossy look but have been hesitant because of the fear that the "finished glossy glaze" would break down or deteriorate against the bare skin, as it is exposed to body oils. Is this a realistic concern? Do you have any suggestions? Thank you! I find Future is best for a shiny finish but eventually all the glazes will react with the skin oils a bit so I generally texture the back part of my pendants to prevent "sticking" and less surface exposure to the skin. You will find the same thing happens if you leave your piece unglazed as well. The polymer loses it's shine over time and will look dull after. The best thing is to clean your pendants between wearing to remove any oils from the skin on it. I see that you show a spray can of the Varathane. Is this safe to use on polymer? In the past I have been told not to use aerosols. Jeanette, Both varathanes are exactly the same exact except one is in spray form. I am not sure where you heard sprays are not compatible with pc as I have never heard that before. It isn't the fact they are in spray form but the ingredients that can react so the type of varathane is important. When you use a spray such as in the varathane or the PYM11, you just want to be sure you do it outdoors as the fumes can be deadly. Thank you for this! I make a lot of pens/pencils. I don't always use a gloss finish, but sometimes I do want to use a finish and I have been struggling with which one holds up over time -- particularly on an item that is handled as much as a pen. This is the first time I've seen this topic addressed in this manner. Thank you Thank you! I am trying to find Diamond Wood Finish by Flecto where have you been able to find it? I am not sure where you live Linda as stores here in Canada are quite different than the U.S. or elsewhere. Here we have the Canadian Tire store that sells it but you can also find it at Home Depot or paint stores. I believe I even saw it at the Michaels store. I live in GA, outside of Atlanta. I had an awful time finding the finish. After lots of investigating, found that Rust-olium (sp?) had bought Flecto out. So, then started searching locally for Varathane Diamond Wood finish made by Rustolium. Found it at Lowe's but they only sold it by the gallon which was $40. That would have been fine if I had about 6 people who wanted to split it, but not a lot of people I know work with clay. Finally found it at Polymer Clay Express (as I remember) in 4 oz. bottles for $5.00. I bought 2! All they had done was buy a large container and devided it into plastic bottles. 2 Good Claymates? I am Carolyn Good and I am sad to say that my husband, BF and claymate, Dave Good, has passed away. We shared many years together and I miss having him by my side. In the meantime, I will carry on with my passion of creating with polymer clay and making one of a kind wearable art pieces, beads, buttons and more. crochet pattern - wine country shawl by kim miller. Return of the Sockeye - Ready or Not!